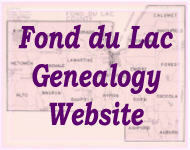 This site represents an ongoing effort to document, and collect data related to the history of Fond du Lac County, Wisconsin. and to share this data with other researchers at no charge. ** Ruth Shaw Worthing, The History of Fond du Lac County, as told by its Place-Names, 1976. ** The History of Fond du Lac County, Wisconsin, Chicago: Western Historical Company, 1880. ** Portrait and Biographical Album of Fond du Lac County, Wisconsin, Chicago: Acme Publishing Company, 1889. ** A. T. Glaze, Incidents and Anecdotes of Early Days and History of Business in the City and County of Fond du Lac from Early Times to the Present, Fond du Lac: P. B. Haber Printing Company, 1905. ** Maurice McKenna, ed., History of Fond du Lac County, Chicago: S. J. Clarke Publishing Company, 1912.